Such fun! You are a prolific quilter; that sure makes it great for those of us who follow you. :) Nope, I couldn't find the boo-boo but that's ok; we usually see our own mistakes when most others don't see them at all. I really enjoyed seeing the assortment of things you have made! Girl, you've got skills! I had to laugh about finding a mistake when taking photos of a finished quilt -- that has happened to me too. Only once was it bad enough that I fixed it -- a quilt made in 3 sections and one section was upside down! I couldn't find your oops though, and I thought the quilt was gorgeous. So many gorgeous quilts! I just love them all!! So many nice and beautiful quilts you show us. Thanks a lot. My favorite is that bright and scrappy log cabin quilt. Wow....that is such a great collection of beauties there. I love the snail trail with the pop of lime in it, but those fusibles are incredible too. 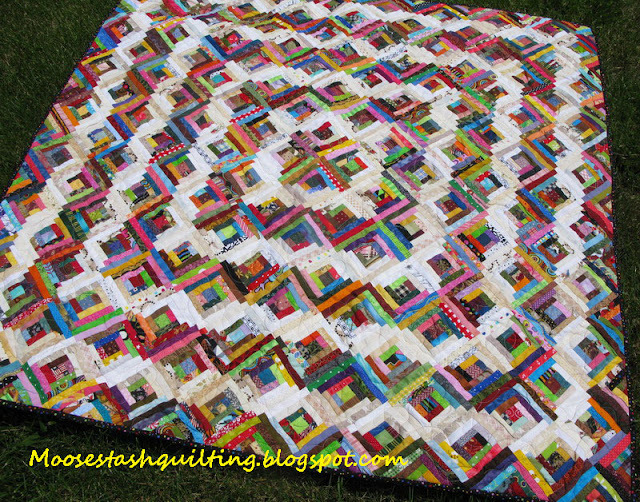 There is nothing quite as pleasing as scrap quilts in my book. It was great fun to see the evolution of your style. I still love your Orca Bay.Thjose orcas appliqued in the border are lust genius! I think that is the quilt that made me find your blog. Apparently I can't type. That should read "those", not Thjose, and "just" not lust"! Loved this tour. Thank you so much. I know you much better now! Wow, those are some wonderful quilts, you like to make big ones! I love the autumn inspired one with the applique pumpkins. They all are beautiful. You crack me up which is why I love visiting your blog. I'm not among the people who created the monster in you, but you definitely helped create one in me. I love what you sew and you totally inspire me! The Orca quilt is incredible! Well, this was fun! I always enjoy seeing where quilting adventures take quilters after that first beloved quilt. Your adventure is eclectic indeed--so neat! I know I don't have to pick a favorite, but your fusible applique passion combined with the Bonnie's pattern in the Orca Bay quilt really grabbed my attention! I hope you shared it with her. You're a very talented lady! So many beautiful quilts :) I love all the different sea critters, too. Fishes and orcas and mermaids, oh my! I have enjoyed seeing the journey of your quilt making. Wow you are prolific. Love your scrappy one. 1" scraps, really?? That must have taken forever. The Orca whale quilt is amazing; that must have taken forever to piece. Love your applique! Thanks for sharing all your beautiful work with us. Your scrap quilts are amazing! 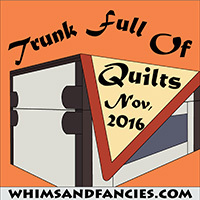 Thanks for the peek into your sewing room and your beautiful quilts! I love the scrappy ones. What a great trunk show Joan, I really enjoyed seeing all of them! Everything you create is always so beautiful! I agree with the others...your are a very skilled quilter. :) :) Your working cabinet makes me smile! I want to do an Orca Bay--yours is magnificent! I loved crawling around in your trunk, LOL It was wonderful to see your beautiful stash of quilts. Keep on quilting!! Beautiful quilts. Thanks for the show. You have gorgeous quilts, the Orca bay is my favorite. You do have a wonderful collection! 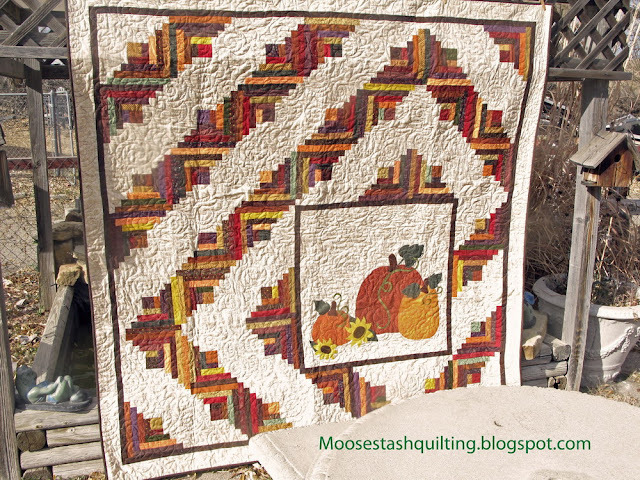 I especially love the pumpkin quilt.... perfect for fall! In all you mess there is glory! Just love your work and would so love to come sit and sew with you. No favorites as they are all wonderful. You are too funny! I see you 'tidied up' in the next post. Care to come attempt the same to my area? You have some lovely quilts hiding in there... love the ocra's you added to Ocra Bay. Such a varied array of quilts. Very pretty to see.